Putting new entries on the website. As you folks know. I love books. I love children's books especially. One can learn a lot about life, about history, about science, about a lot of things reading children's books. Stories told in a simple manner can explain complex ideas. This little book is about animals with human characteristics. Some are heroic, and some are not so nice. Like all good stories, the wicked are punished and the good rewarded. At least that is how it used to be. 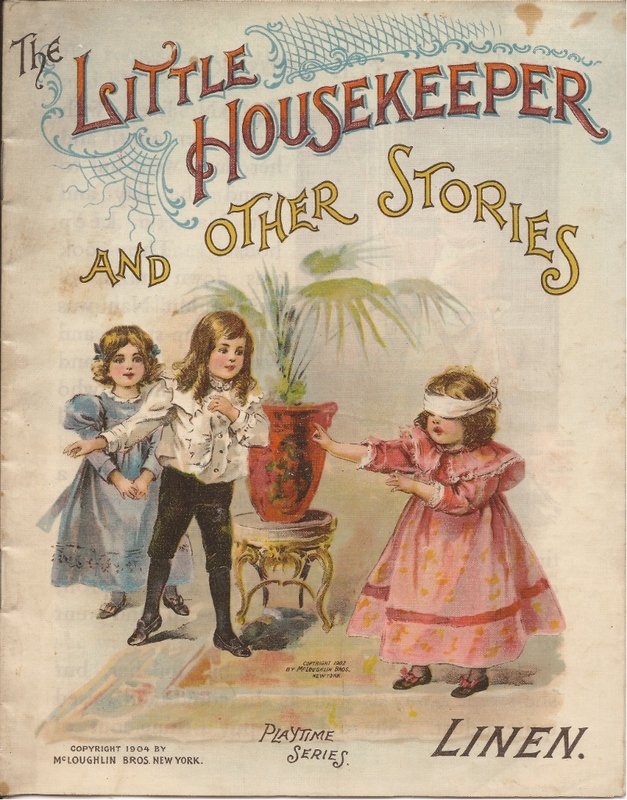 You can find this little book on the Children's Books page on TryonCountyBookshop.com. I never had time for books that didn't have a happy ending, where good didn't triumph over evil. Today things seem to be all upside down. I am also starting a new page on the website. Minerals. We collected rocks and minerals for many years. We traveled around the east coast collecting, and spent a lot of time in Canada. We had some outrageous adventures, and many good times with the fine people who collect minerals. Our first card arrived very early this year, right after Thanksgiving. 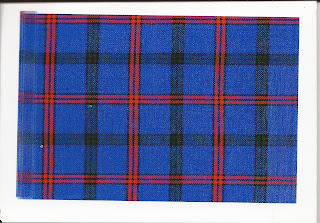 It was from Kerr and Mary Montgomery of Irvine Scotland. They are very dear people and we remember them fondly from Roots 97, and the Montgomery Scotland trip of 1998. The first picture is of the Tournament bridge at Eglinton Park where the tournament was held in 1839 that nearly broke the Montgomery family because of the weather and the excessive expenditures to host the tournament. 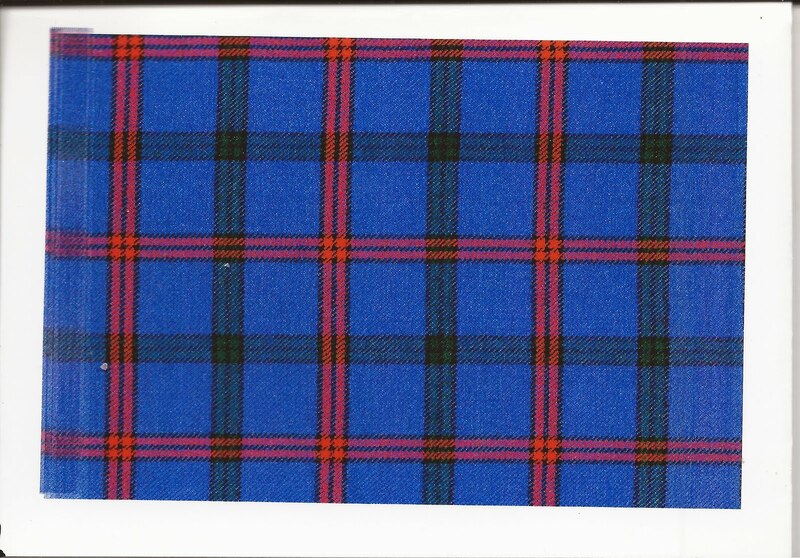 The second picture is the Montgomery tartan. 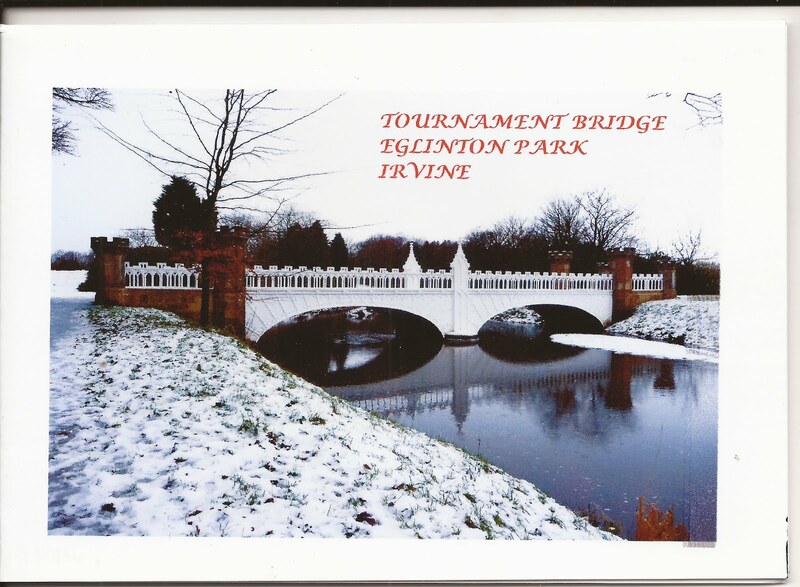 We have received a lot of other cards since then and are very appreciative of them considering that we haven't sent any in two or three years. First off, we had sickness and then we had brokenness and the cost of postage keeps going up. I have four boxes stored upstairs waiting the opportunity to send them. If the economy keeps going down hill that might not be for some time. I have sent all my face book friends cards on line and I guess that will have to suffice for the time being. I have always thought of Christmas as a magical time of year, and have always loved the holiday and all the wonderful things attached to it. For many years I made little things for my friends at work, and the family. It was so much fun when the kids were small (and I was working at Sears...employee discount.and toy department) to find just the things they wished for most. We had some really great Christmas'. God is good! Matt offered to get us a real tree this year, but I don't have room for any more mess, do I declined. Then, I got thinking of the artificial tree, I won many years ago at the YMCA raffle. I dug it out of the cellar, but I couldn't find the base. It already had lights, so we decorated it with some wooden stars and moons that came with it, and added some energizer bunny decorations that wouldn't break (we hope) We both enjoyed looking out the dining room window at it and we left it lighted all night. One morning Dad got up real early, as is his wont, and saw the the tree was bent over backwards onto the deck. "Your tree fell over!" he said. Come to find out it had broken right off at the base. The ice and rain had been too much for the poor little thing. He tried to fix it. He drilled a larger hole in the base to stick more of the tree down into it, but the branches were in the way and it wouldn't go. It laid there, lifeless, for a day or so. Then, today while I was getting dinner, I heard a few thumps out in front. I looked to be sure Dad was OK. I worry about him when he goes out. There in somewhat less than perfect condition was the little tree. Now truly a Charlie Brown tree, standing up again but not on the railing of the deck, but down in front of it. He had me plug it in. The lights still work. We have a Christmas Tree!!! Merry Christmas To All! http://www.tryoncountybookshop.com I invite you to check out our Bookshop website. We are having a gigundus sale on fishing books, if that is your pleasure. It is for a limited time only, so hurry on over and take a look. I have updated the children's book page and added several more books. I intend to keep adding them as I dig them out from my inner sanctum. We had an early Thanksgiving Sunday with Roger's family. This is the home-made bread our youngest son Matthew made for the party. There were 40 attending, and a good time and full tummys were had by all! Then yesterday we were invited to Matt's house, along with Roger's sister and brother-in-law. Another great meal, and I put back on that four pounds I had so painstakingly lost. Hopefully it will drop off with a little due diligence. I have been sorting some books from the kitchen, (we have them stored everywhere) because I wanted to mop the floor and it is a little chancy when there are books all over. I took some out to the shop, and priced and shelved some in the computer room. At least I know a little about what we have. Some of them were Colt Books which are not on the website. R. L. Wilson stuff that has been reprinted several times, but these are all first editions in fine condition with dust jackets. Since it is BLACK FRIDAY I started my Christmas shopping here in the house. I found a lovely book I know our youngest granddaughter will love! So I have put it aside for her. Hopefully I will be able to find it when the time comes for wrapping. Fortunately most of our family loves books, and we do seem to have an abundance of them. "A beautiful new edition of the original Sambo story that belongs in every child's library. 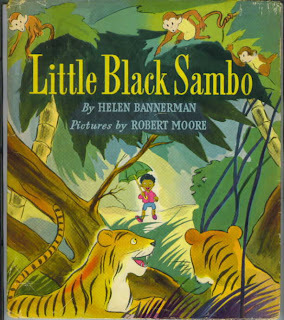 The amusing, sparkling illustrations do full justice to this famous tale of the appealing little black boy who lived in the jungle." I always loved the Sambo story, because I always loved pancakes, and so did Sambo. 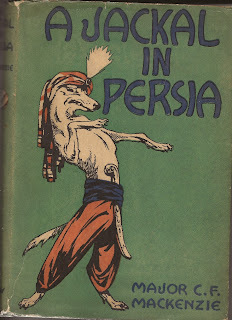 This edition published in 1942 is the one I love best. I have several editions, including some very early ones, that are nowhere near as apealling as this one. The illustrations are stilted, and not very colorful, more like stick figures. G&D did a great job when they published this. It is a shame that political correctness has put a tarnish on this lovely story, of courage, and family togetherness. I was alway very pleased that Sambo was able to outwit the tigers and get all that butter (which I also loved) for the piles of pancakes that Mambo made.....which reminds me of another story my Mother used to tell. Barely past the depression, and still living in stringent times, although Daddy now had a job, we went grocery shopping Friday's after work. 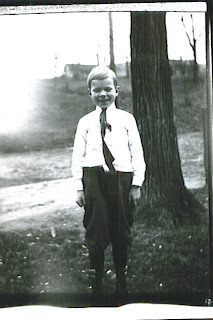 We went to Putman's market for meat, Acme market for canned goods, Grant's for any clothing purchases budgeted for that week ....socks for Dad if they were past mending, and of course we kids outgrew stuff faster than it could be replaced. Sometimes if we had a lot of groceries, we would get a Cab home. Mostly we walked each carrying a paper bag scaled to our ability. This time, I don't remember how we got home, because Ed and I were quite small. Mom told us that they set the grocery bags on the kitchen table. She and Dad had to do something out in back before they checked the groceries. I think it had started to rain and they were bringing the clean clothes in off the clothesline before they were soaked. They always checked each grocery item against the register tape to be sure they had all they had paid for, and each price was charged correctly. If there were any errors, even if something had been put in the bag without being charged, Dad would go back to the store and make it right. When they came back into the house after rescuing the clean clothes, they found Ed and I, up on the kitchen table with the groceries each eating a bit from a stick of butter. We must have worked up an appetite from the long walk home from downtown. Yesterday I saw a robin. A Real LIVE one. He (she) was flitting around in the crab apple tree outside my dining room window. I was lingering over a late breakfast, enjoying the rare sunshine, and a bowl of my special fruit laced oatmeal when a movement caught my eye, and the flash of the red breast. I peered. I didn't have my "see the bird" glasses on, but the formation and the color convinced me. I enlisted Dad to look. "It's just a starling." he pronounced. He couldn't see it that well. It was behind some branches in a crotch of the tree. I kept watching. He came out to the end of a branch. It was definitely a robin. "You should put it on your blog." Dad said, even though he didn't believe it was a robin. "Yeh" I agreed. I hadn't been able to sign in the last time I tried, so I didn't hurry to the computer. We went on with our usual daily pursuits. We unloaded the car..34 boxes of books brought home from the show. Two were empty. That was good news. Now we had to replace the books we sold. That is a litte easier said than done. Some things we had back ups for, others we will never be able to replace. I contacted a couple of local dealers and was able to fill in some holes. Then I remembered a crate of books Dad had purchased at Rochester, three or four, or maybe five or six shows ago. Most of the books in it were items we already had in stock, so we just pushed it under the stand in the front hall and forgot it. Out of sight, out of mind. I dragged it out of the front hall. It now reposes in the living room. Some of the books are still ones we don't want to take to shows, but a couple of them were really nice to find. Sometimes it is like Christmas going through boxes. A nice monograph of Roland Clark's hunting pictures will look nice on the table at the next show. I don't remember when we sold the last copy of "The 45-70 Rifle". There was a second printing in the box, and one on the Sharps Rifle too. So it was a good treasure hunt. Now I have to put the crate back. So today at breakfast, (fruit bowl, bacon and toast, orange juice & coffee) I remarked, "I wonder where my robin is?" I looked...and there he (she) was! Right back in the crab apple tree for breakfast! This time Dad saw him, and pronounced, "By golly you are right, it is a robin! This is pretty early for them here!" Of course, the thermometer says it is 50 degrees and the snow is melting off the roofs of the sheds so Dad won't have to shovel them now....unless the storm heading our way piles it up too high again! The carved robin was done by Dad in 1981. He went to a couple of carving shows and then was sold to a dear neighbor, who loved Dad's carvings. When she moved to a small apartment, after her husband died, I bought him back, and appreciated her offer of him, because I always loved him too. Theodore was the youngest of James & Carrie's boys. He was about 16 when he lost his mother in 1920. From the tales he told, I am inclined to assume he was something of a devil. He told one of the truant officer coming to find him one day when he skipped school. He was up on the shed roof, making repairs ( if his story is to be believed). "I'm looking for Theo Montgomery", the gentleman called up to him. "Nobody here by that name", he replied. "How about Theod. Montgomery?" the gentleman inquired. "Nope, nobody here by that name either." After several tries to make something of the abbreviated name in his records, the officer left, but somehow, I think he knew his quarry was right in plain sight. Playing in the streets was commonplace during Ted's boyhood. One fall evening, when dusk was approaching, he and a bunch of his buddys were tossing matches (lit of course) down through the hole in a manhole cover. All of a sudden, the sewer gas in the pipe was afire, and flames were spurting up through the hole in the manhole cover. Fearing that the burning gas would somehow catch a passing hay wagon afire the boys tried to put out the fire by tossing dirt down he small hole in the manhole cover. Handful, after handful went down the hole. Suddenly, there was a horrible rumble and the manhole cover flew up, up, up into the air, followed by a rush of air that put out the fire. Not waiting to see where the cover landed, the boys hightailed it home. Ted ran through backyards, ducking under clotheslines filled with clean white linens, and plodding through gardens with abandon. Upon his arrival, he was met by an irate father, who dragged him out behind the woodshed and proceeded to whale his nether regions. He thought one of the neighbors had complained about his mad rush under her clothesline, or through her garden. It wasn't until many years later, somewhere around 1935 that his brothers explained to him that the sudden rush of sewer gas from the exploding manhole had "Blown the old man off the toilet!" and somehow he knew that Teddy was involved. Back row: Dan, James E. Front row: Ernest, Earl and Ted. Last Sunday morning the inhabitants of this community received a shock, which,, while it excited the sensibilities, at the same time touched the inmost hearts and sympathetic natures of all, when it was learned the the home of Eugene Ferrin, who lives in a house belonging to Wm Ostrander, situated three miles from this village on the McHenry Valley road, was burned to the ground, together with the entire contents and two of the Ferrin's children had perished in the flames. About twelve o'clock Saturday night Mrs. Ferrin arose and put a chunk of wood in the stove to keep the fire unti morning. She then retired again and her attention was soon attracted by a reflection of light which proved to be a fire which had started around the stove pipe hole down stairs. Mrs Ferrin gave her husband the alarm and went to the stair door and called the three older children who were sleeping overhead, two boys in one room and a little girl in another. They answered and the little girl came down. The fire was at first apparently not very serious and Mr. Ferrin endeavored to extinguish the flames with tow pails of water which were handy; but this amount being insufficient and the water privileges being very inconvenient, he was obliged to abandon the effort. When it became apparent the house would be destroyed, Mrs. Ferrin rushed out of the house with her baby and little girl. Seeing that the boys did not come down stairs in response to the call, Mr. Ferrin became alarmed for their safety and started up the stairs to rescue them but was met by a wall of seething flame which caused him to retreat. He then rushed out of the house and after procuring a ladder climbed to the chamber window which was located near the bed in which the boys had been sleeping. We are informed that when Mr. Ferrin broke through the window he found that the children had left their bed and were in the opposite corner of the room cut off from him by the flames so that it was impossible to effect their rescue. In his efforts to save the children he was very badly burned, the hair being burned from his head and his hands and one side of his face being entirely blistered. The two boys who were cremated were aged 9 and 3 years. Mr. and Mrs Ferrin and the other two children escaped with nothing save their night clothes and walked one third of a mile to Mr. Otrander's in their bare fee. The night was severely cold, the thermometer standing at eight below zero, and their feet were badly frozen from the exposure. They are at present at the home of Mrs. Ferrin's parents, Mr. and Mrs. Henry McIntosh, and it will be some time before they recover from the burns and effects of exposure. 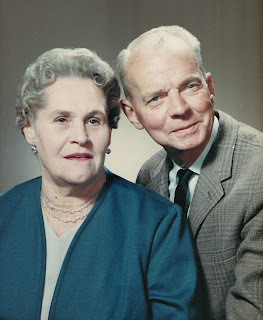 Mr. and Mrs Ferrin have the sincere sympathy of the entire community in their great calamity and bereavement, and several parties are busily engaged in collecting effects to aid them in their time of need. Surely this is a Christian duty, and we trust that all will join in bearing these heavy burdens that they may be made as light as possible for those on who they will fall with crushing weight. The remains of the little ones were placed in a casket together and interred in Woodlawn Cemetery Monday afternoon." Helen was born four years after the fire. She was later adopted by the Lippincotts. Her older brother, the baby in the fire, came looking for her when she was 15 years old. Until then, she hadn't known she was adopted.